Whole crew at Old Friends Farm pose in field. Land in the Pioneer Valley, the alluvial plain along the Connecticut River, is arguably the best farmland in the state of Massachusetts. 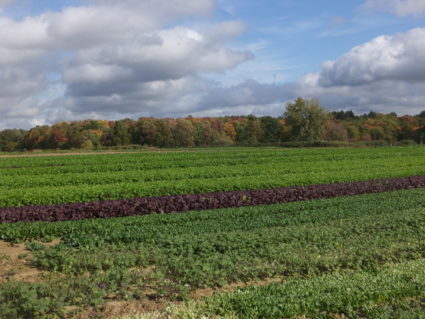 In fact Hadley loam, a deep, well drained soil formed in the silty alluvium of level flood plains and considered one of the premier agricultural soils in the nation, is named for the town of Hadley, which is adjacent to Amherst, Massachusetts. Adding to the quality of the soil there are the valley’s moderate elevation (mostly under 300 feet) and ample rainfall (approximately 48 inches per year) which make land in the Valley a Mecca for Northeastern farmers. 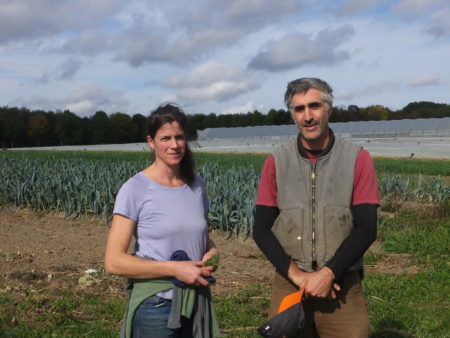 Two young farmers originally from New York and Vermont, Missy Bahret and Casey Steinberg, migrated to the Valley over a dozen years ago by different paths — but ended up running a farm together in Amherst. “Basically that is outdoor adventure mixed with ecology and environmental education,” inserts Casey. Missy spent time hopping around on different farms with a goal of learning more about farming and where her food came from. She eventually moved to the Pioneer Valley because it was a vibrant farming area. She had been on a farm for 3 years previously, and thought she should keep exploring. Having interviewed at 3 places in the Valley she was dismayed at the wages she was offered. 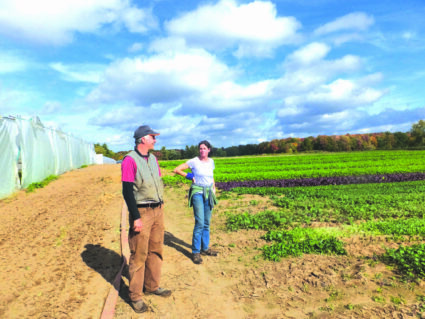 Missy Bahret and Casey Steinberg in the fall of 2016, showing some of the vegetable production areas on Old Friends Farm. Casey grew up in southern Vermont and Connecticut, his mom in Connecticut and his dad in Putney, Vermont. He also moved to Chilmark, independently of Missy, and did a bunch of garden work — gaining outdoor growing/manual labor experience there. He apprenticed for a season, then was assistant manager for two more years at Brookfield Farm in South Amherst. From there it was a small step to join Missy at her farm a year after she started it. He has been there now for 12 years and co-manages Old Friends Farm with Missy. They lease their land from Bramble Hill Farm — which is owned by the Open Field Foundation, a nonprofit private operating foundation created in 1996 by Gordon Thorne and Anne Woodhull to hold the assets of Bramble Hill Farm, to protect and sustain the unique and diverse ecologies associated with open land, and to explore alternative uses for productive agricultural acreage. Bramble Hill Farm was the location of a dairy farm on Route 116 in South Amherst. It was a highly visible farm, abutting the town golf course among other properties, and was the first in Massachusetts to be set up under the Agricultural Preservation Restriction program — to prevent it from ever being developed. Casey and Missy are at the end of a 5 year lease right now and talking with The Open Field Foundation about a 99 year one. The pair primarily raise salad greens, although they also have vegetables and flowers. About 25 or 26 acres are in active production. They take the plastic up every year — it isn’t too much of a hassle if they have done their weeding. The plastic lifts up and comes off pretty easily. They don’t use biodegradable plastic because it is not approved in organic production. A half acre or so of salad greens are seeded each week, and since the crop takes only four weeks until harvest the beds can be reused three times in a season. All the farm’s tillage and bed formation and seeding is tractor-based. They use a high density seeder which requires a perfectly level bed. “We used to do this in a different way,” Casey explains, “where we made our beds and sowed individual lines with a seedway seeder. Then three to five of our crew would spend three or four hours on their knees tending them. We figured that wasn’t sustainable – everyone would need knee replacements. But we have no intention of using up our workers. We want them to be able to be farmers for life, and not aching or groaning. So we decided to make changes to our work-place so that it is a positive experience and safe and healthy for our workers. We said let’s put this to the forefront and if we can’t make it we can’t make it. “For salads we don’t cultivate,” he continues. “We plant so densely and prepare our beds so that weeds aren’t a problem. We use stale bedding. We harvest an area and turn it over for two or three weeks and then get another week or two of weed suppression, and then plant it. The weeding can be done in the form of tillage, but there are other ways to deal with weeds. In preparing the soil you can make the bed really shallow and let the bed former scrape the top layer off the bed, including weeds. Or we have a basket weeder we can use, or a flame weeder. But it is an issue that we think about all the time. Because we have a land crunch and we need to support ourselves and our crew, we trade our crew’s quality of life and physical wellbeing for tillage. Pests are a problem for Missy and Casey. They say they have lots of flea beetles, aphids, and tomato hornworms. Row covers are the main things they use for control, but they’ll spray for hornworms in the greenhouse. Mostly they try to use crop rotations and spacing to prevent pests. Last summer, of course, Massachusetts experienced an extended drought. Old Friends Farm was heavily impacted by it, being without their staple crop – salad greens – for six weeks! Some spotty storms came by and some farms got precipitation, but not Old Friends. The farm has two ponds for irrigation, but both ran dry (or got so low it was below Missy and Casey’s threshold of a respectable ecological level). The pair had to contract with the town to get water from fire hydrants. 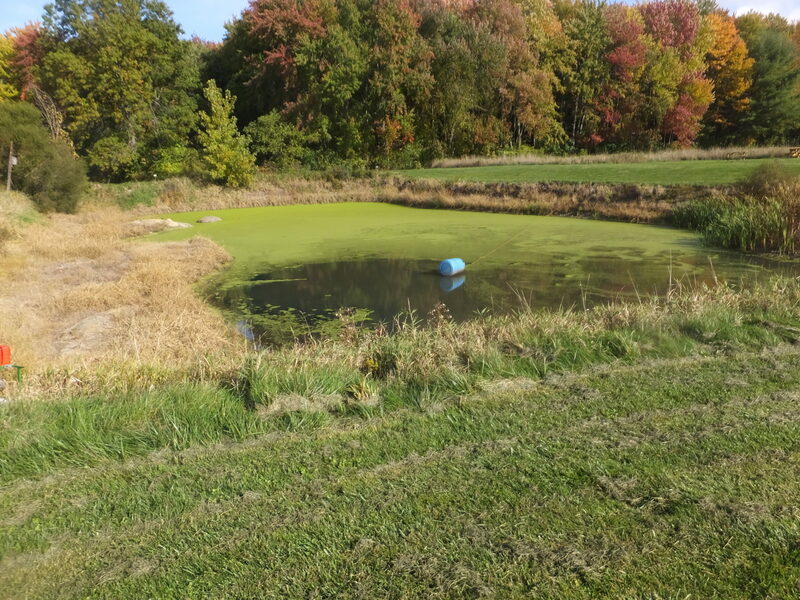 After the dry summer of 2016, the irrigation pond is pretty low. Irrigation for the salad greens is overhead because drip would be too much of a hassle. It would have to be moved from fourteen 300-foot beds — 4 to 6 lines per bed — every time they were seeded. Casey estimates that the farm sells 60% of its produce wholesale and 40% retail. Missy thinks it is even more wholesale, probably like 75:25. The retail sales are primarily at two farmers markets – Amherst on Saturday and Northampton on Tuesday. “Farmers markets used to be all we did when we were first starting,” says Casey. “We did 5 a week and sometimes two on one day. We slowly pared that down to just 2 for our peace of mind. To load the truck at 6 am and go to Boston and sell all day and not get home until 11 – that is a hard day to put anyone through. For almost a decade Old Friends Farm has been certified organic, through BayState. Casey feels being certified organic means a lot to both their wholesale ac-counts, as well as at the farmers markets. Missy agrees. Most of the salad mix is sold wholesale. It ships in 3 lb. cases for $21.75 per case for large orders. Whole Foods and River Valley Coop are among their best customers. After so many years at it, Steinberg and Bahret are no longer starry-eyed about farming. If asked to characterize their attitude now, they say, it might be some-thing like wanting to ‘work smart’. “There is a cultural mentality,” says Missy, “that you farm from dawn to dusk, that you don’t treat this as a business, you don’t have hours. That it should be all-absorbing is the cultural norm. It is part of our goal to not do that. A lot of people don’t have that goal or else they would stick to a stopping point. If a pro-ject can’t get done they would change their operation next year or not grow that crop. “I think pride is a big part of it,” asserts Casey. 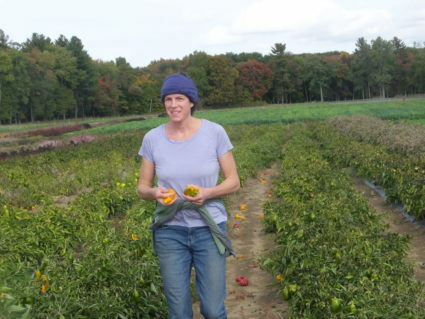 “When I was a newer, younger farmer I was proud that we did all these markets in Boston. We worked 70 or 80 hours a week. That was a source of pride. A few years into that I started seeing that pride as a little foolish, a little misdirected. Now I feel really proud that I am less of a workaholic than I used to be, I have other things going on, I feel proud that we are able to identify our limits instead of pushing to do more and grow bigger. “Ultimately that comes from wages,” Missy inserts. “We’re trying to create a workplace that isn’t subsidized by low wages. We actually try to work smart with a goal in mind and be ruthless, like with the chickens. We enjoyed them, we loved having the eggs, the customers loved them, they had so much going for them. But we rode it out for too many years. When held up against the pair’s goal of meeting a triple bottom line — a healthy environmental, social, and economic result — they were not making it eco-nomically. They had to be changed. “We time tracked the labor to measure them,” relates Missy. “We did it for a whole year. That seems like a big deal, but all it is is a pocket notebook and a pen-cil. We give everybody a watch and they can write down how long they spend when we are time tracking something. There is really no other way of gauging it accurately. “QuickBooks will tell us what our receipts say,” she continues, “but labor is hard to track – unloading feed, washing eggs, moving houses, anytime you are do-ing anything relating to the chickens, write it down. One person would compile the little pieces of paper with notes of 2 minute here and 5 minutes there. And that person’s wages would be counted, too! Old Friends Farm has hired more employees as its business has grown. Counting Missy and Casey, the crew is now 13 people — one works for the full year and the rest work March through December. During January and February some will travel and some pick up other work. All are post college, with the youngest being 26. The farm has a high worker retention rate and the employees are getting older. Wages range from $11 to $16.50 per hour with a systematized sched-ule of increases. Many years there are no jobs available at Old Friends Farm because of its good retention rate. So the owners have to make an effort to let people know when one opens up. They will scope out other farms just like baseball scouts to find good candidates. But mostly, Missy says, applicants hear about jobs there through word of mouth from current workers. One of the reasons workers stay there may be the high level of communication between workers and managers that both Missy and Casey try to maintain. Beside encouraging workers to express their financial desires, the farm also tries to accommodate their professional interests. As an example of this responsive flexibility, the farm will be growing more this winter to support an employee who wants to work there year-round. Right now, according to Casey, wages for all 13 workers represents about 21% of the farm’s budget. Although by normal standards that is considered a suc-cessful ratio, Casey and Missy are trying to get it higher! “Once we bumped everything a dime,” Casey recalls, “and over the course of a season that was $15,000. That’s half an employee right there. If the minimum wage was raised we’d just have to figure out how to cover that cost. “So what is at the root of that,” Missy asks? “It is not true that we are elitist. The work we do with the food stamp program and accessibility have helped this food to be accessible. And I don’t feel good about running a workplace where my employees’ ability to cover their costs is cut in order for someone else to get cheaper food who maybe have put their kids through college already and have a retirement plan! Both Missy and Casey feel that communication lines are important to making employment successful. They check-in with new employees after a month of work, then do a mid-year check-in, then a check-in at the beginning of the new year about how people feel about returning, what they want, what are their needs. They also do a closing or exit interview whether the employee is coming back or not. “There is also a monthly meeting,” adds Casey, “where we activate our ‘wheel of appreciation’. That is a dry erase board in a circle which spins. It is divided into pie pieces. You can nominate anyone and say why you appreciate them. At the end of every month we read each one out loud, there are probably 16 slots, we spin it and whoever it lands on gets a free massage. The reading of it out loud is important – you hear what others do which contributes to a culture of ap-preciation. Both Missy and Casey say a key aspect of managing is respecting that everyone works best in positions they have an interest in. When you cater to people’s interests they are more productive. They stay engaged more and have a better work experience. So it is a 2-way win. Different people also learn in different ways,” Missy elaborates, “and we have done a bit of work on learning styles and how co-workers can learn to relate with each other in a style that will be received best. We do a monthly recharge meeting. We have some sort of theme and it is really a sort of pep rally. We do some group team building activity that is applicable to work. Casey and Missy are active in the Agricultural Justice Project and its effort to campaign for living wages and worker empowerment, certifying farms and busi-nesses throughout the food chain which meet its standards. “The AJP has been a great help in getting us to get together a lot of our thoughts,” attests Missy. “They have thought through most of these issues. One of our employees is very active in AJP and is trying to get someone up here to train a certifier. We are trying to get enough producers onboard to fly someone here to do that. They want three farms to participate. As the farm gets bigger, both owners are aware that it has become more complex and difficult to manage. That is another reason to have active, involved work-ers. Casey has even mused about turning the farm into a workers cooperative.